Switch case statement is used when we have number of options (or choices) and we may need to perform a different task for each choice. Explanation: In switch I gave an expression, you can give variable also. I gave num+2, where num value is 2 and after addition the expression resulted 4. Since there is no case defined with value 4 the default case got executed. This is why we should use default in switch case, so that if there is no catch that matches the condition, the default block gets executed. 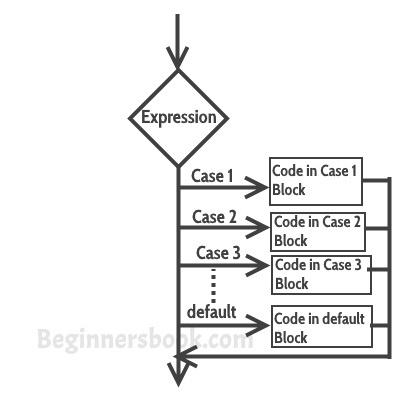 First the variable, value or expression which is provided in the switch parenthesis is evaluated and then based on the result, the corresponding case block is executed that matches the result. Now you can see that only case 2 had been executed, rest of the cases were ignored. The control would itself come out of the switch after default so I didn’t use it, however if you still want to use the break after default then you can use it, there is no harm in doing that. 3) The expression given inside switch should result in a constant value otherwise it would not be valid.